Shine through the holidays with these amazing nails. Everyone likes to have beautiful nails for the holidays. Whether you celebrate Christmas, Chanukah, or Kwanza you need these nails to get you through. Check out these amazing and shiny foil and glitter nail designs you cannot live without this season. Try some glossy nails that mimic stained glass windows of a church or synagogue. These will be the envy of all your friends and family. Even if you’re not religious make sure to go to at least ONE service to show off these adorable nails. Shiny gold and metallics are a huge deal this year. Mix them with different patterns and blue hues to create the perfect winter inspired holiday look. Keeping with the theme of metallics, glitters and blue hues this manicure is perfect for every occasion. Chanukah or winter nails never looked so beautiful. Everyone has a dark side. why not have a battle of colors with Christmas red versus Chanukah/icy blue. Don’t choose a holiday or sides. Make them both your own with this fabulous and glamorous nail art. These purple nails remind you of the Aurora Borealis. Perfect for winter time when people in North America can see these gorgeous natural light show. These are definitely more for Halloween, but if you have ever read winter stories about scary queens this could go along with your Snow Queen theme. Green, of course, is known as a Christmas color. Add in those trendy gold metallic and you have a perfect manicure look. Royal purple is a huge part of the trend this season. Be sure to get that shine with some clear glitter nail polish on alternating nails for a glam look. Melt hearts this year with the season of giving. Incorporate purples, pinks, and whites to have a great holiday manicure. Then add in some heart shapes to show that you are in the season of giving. 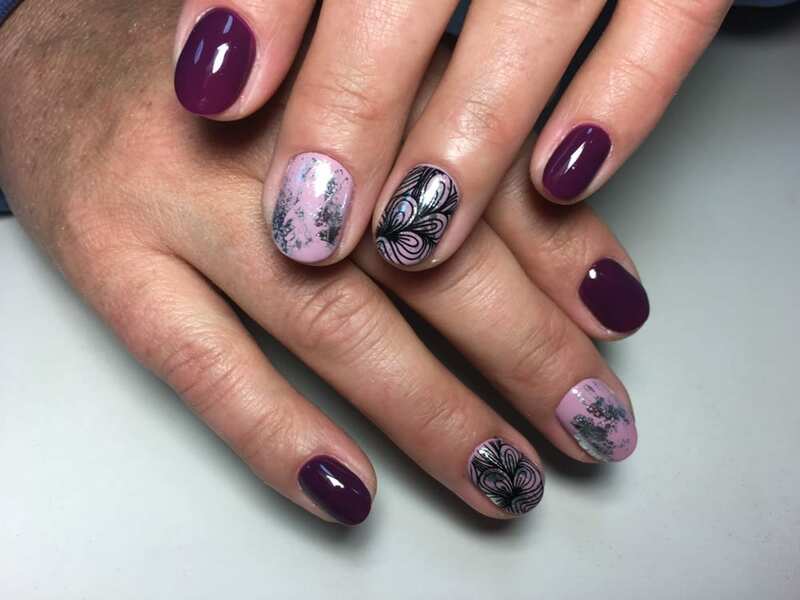 Sparkly purples and nail art snowflakes are perfect for this time of year. Purple is a royal color and as a royal was supposedly born during this time that’s why it’s upping in its trend for manicures this season. This is a mix of different elements. You have gems, metallic stripes, glittery purples, bright pinks and ultimately an exotic look that’s perfect for Kwanza. Metallic black nails are perfect. Winter gets darker and darker every year so the black nail polish mimics the darkness that winter brings. The metallic shine mimics ice and the sun’s most powerful day of the year which happens to be Dec 25th. Gorgeous for long or acrylic nails these metallic with whites, blacks and golds will look stunning on you at your next holiday dinner. Metallic silvers with blacks and star nails will set you apart from the crowd for your new year’s eve parties. These long elegant gold and gem nails are perfect for New Years or Christmas. Blues and Metallic golds are a common trend this season as we have seen before on this list. Long nails are gorgeous. Black and blue metallics give an icy and almost black ice feel to this sultry manicure. Gold flake nails are very minimalist and beautiful. These are perfect for any holiday this season. Red is a Christmas color and the metallics mixed with the abstract patterns are sure to please at your holiday dinner. It almost seems like Santa’s flight route in a much more elegant way. Whatever nail art you decide to wear this year you will be sure to enjoy your holiday season and your manicure!